You will discover the power and effectiveness about understanding human behavior and psychological triggers that will help you get more yeses. NLP techniques you can blend into existing recruiting conversation to give it a new level of influence, persuasion, personal confidence and more yeses. 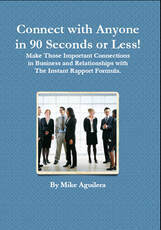 ​​Blend and layer these NLP elements into your presentation to make it magnetic and irresistible. ​Module Three: What to do and say when you first meet to position/frame yourself as a leader (at the table). And, how to begin the conversation what to do to create openness, rapport, leadership and to maintain influence. Module Four: What to listen for to identify if a person has subconscious motivational driver of achievement/pleasure/towards or avoidance/pain/away. This will help tremendously when presentation the opportunity. Module Five:​ ​Subconscious motivation question one. Discover if they are procedural or bottom line. Get insight into what you need to say so the they take action and join. And, to utilize should they have objections. ​Module Six: Subconscious motivational driver - questions two discovering business opportunity values, beliefs, pain and desires. *"What's important to you about a business opportunity?" ...What's important about that? ...tell me more. Module Seven: Personal coaching and mentoring criteria question that creates bonding and subconscious motivational driver understanding. Module 11: Calibrate to say on track and get more yeses. Module 13: Pace and lead their imagination to join. ​Have magnetic compelling conversations. Explain to potential new member what to do to be successful... blending in NLP subconscious communication techniques to get more yeses. Blending it all together that will make it easy to transition to the close. 1. Invite to continue conversation. 2. Have them say out load. 3. Compliment them with a characteristic...do what they say they will do. In case you missed the gifts...on how to begin a recruiting conversation with anyone. Click here and listen to around one-hour of valuable NLP tips and techniques.